Superior Cleaning and Restoration Inc. have been helping the people of San Diego with their carpet and rug cleaning services for years. We use extraction units that employ only truck mounted hot water and pair them up with some of the best cleaning products that are also eco-friendly. The methods used by our experts are recommended by some of the biggest names in the carpet manufacturing industry. Our team of professionals are ready to tackle any sort of carpet and rug cleaning situation which could range from a stain to odor removal. We restore your carpets back to their original condition. One major health concern that people deal with in their homes is mold and mildew. 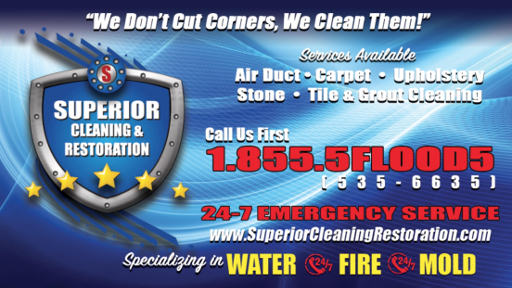 At Superior Cleaning and Restoration Inc. we can help you with whatever remediation or prevention services you may need. In order to lead a healthy lifestyle it is important that you address the issues of the air quality of your house, so that you can protect your family against any sort of bacteria, mold and mildew. Another useful product we offer is Teflon Carpet Protector that helps in the reducing of wear and tear in carpets that witness heavy traffic. Apart from this it can also help protect your rugs and carpets against spill stains, dirt, pet, stains, grease and oil. Our experienced staff is here to assist you at every step along the way, with any queries that you might have and any assistance that you may need. Feel free to call us up anytime, we are happy to be of service. And always keep in mind that if it’s Superior Cleaning that you are looking for then Superior Cleaning and Restoration Inc. is the company for you.